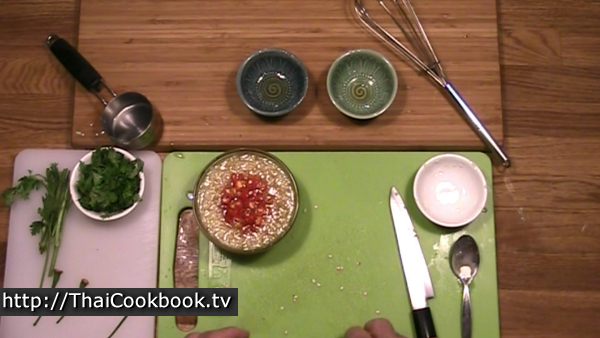 If you really want to know how to make your Thai dishes taste authentic, you need to spend some time learning to do some of our common table condiments and sauces. This type of dipping sauce goes by the generic name "seafood sauce", or nam jim see fuut in Thai, and the name itself can refer to many different kinds of dipping sauce made a lot of different ways. In Thailand we eat a lot of fish and seafood, and we always serve them with a nice sauce that has a balance of sweet, salty, spicy, and sour flavors. This is what makes an ordinary steamed or fried fish taste like Thai food. Loaded with lots of fresh garlic and cilantro, this sauce is not cooked, so it only lasts a little while before it starts to lose some of it's sparkle. You should plan on making it up right before you serve the meal. 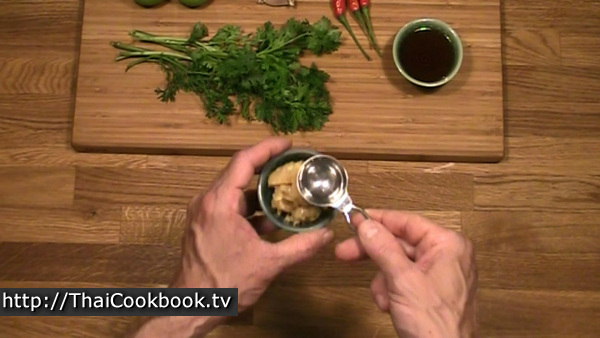 What's in our Garlic, Lime, and Chili Dipping Sauce. 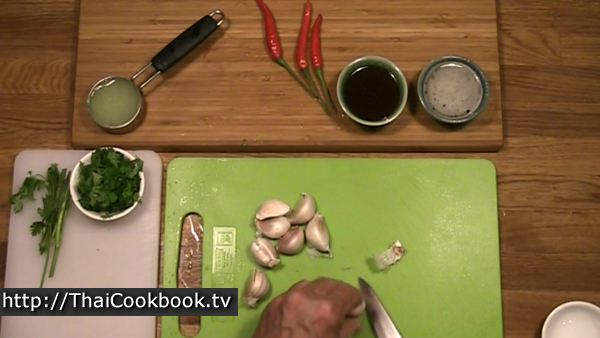 How we make our Garlic, Lime, and Chili Dipping Sauce. 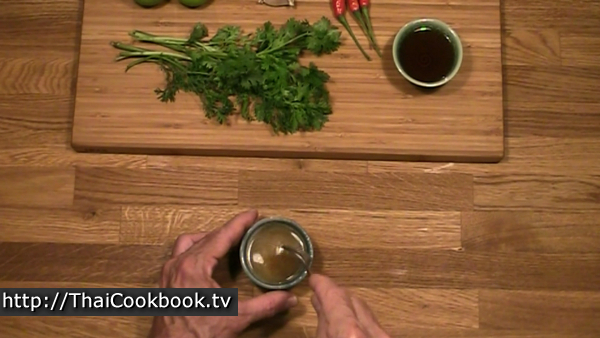 1) Dissolve coconut sugar in water, then blend it with lime juice and fish sauce. 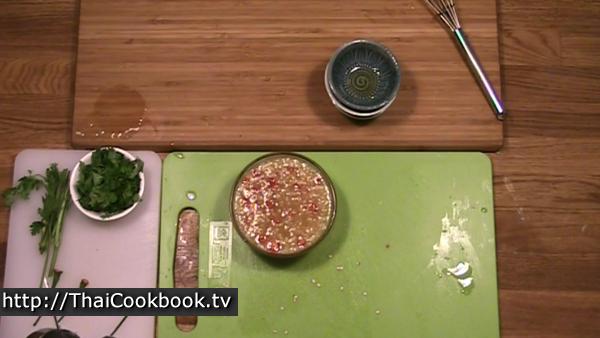 2) Add chopped garlic and sliced chilies, stir up well, and let marinate for 20 minutes. 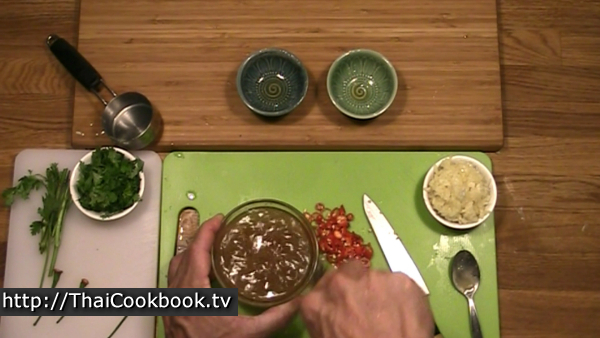 3) Just before serving, add sliced cilantro leaves. 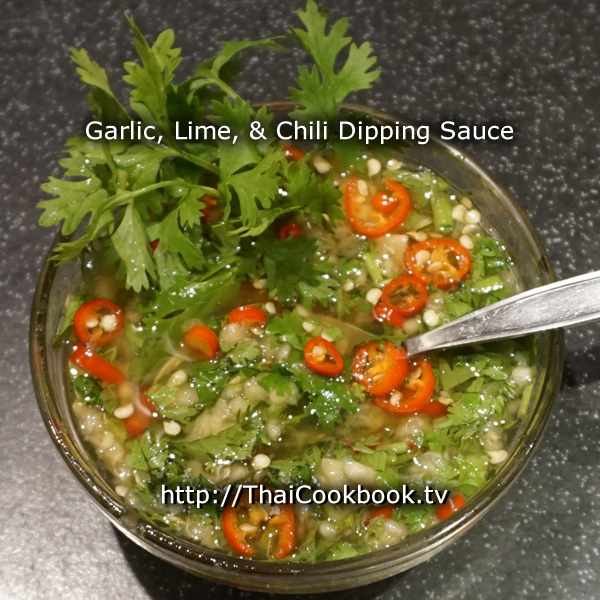 It's the balance of sour lime juice, candy-like coconut sugar, salty fish sauce, and spicy hot chilies with lots of garlic and cilantro that give this sauce an authentic Thai flavor. Make a sugar syrup by dissolving the sugar in one tablespoon of water. Heat in the microwave for about 15 seconds. Do not boil, just get it hot. Stir it up well until it is smooth and sticky. Squeeze enough fresh lime juice to give you at least 4 tablespoons. 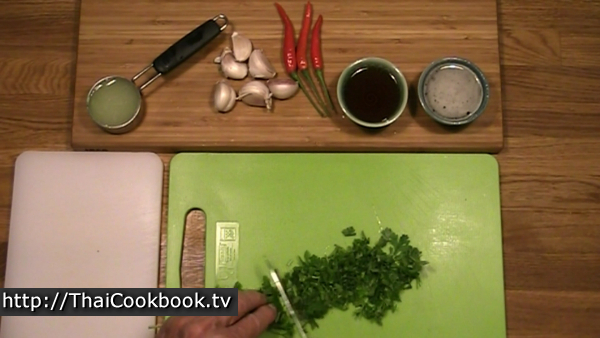 Slice the cilantro gently so it doesn't bruise and squeeze out all of the juices. Avoid chopping it up. It needs to be pieces about 1/2 inch long. Peel the garlic cloves, and chop it or press it to get about 3 tablespoons of finely chopped garlic. 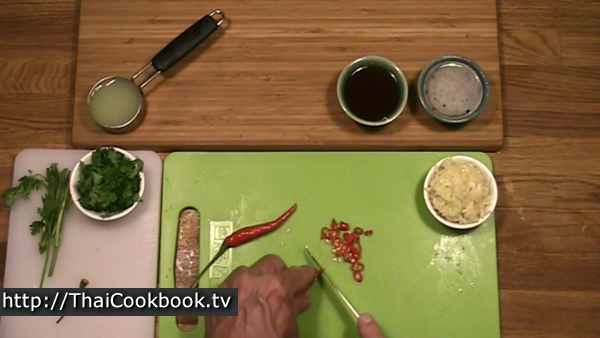 Slice the chiles into little, very thin, rings. 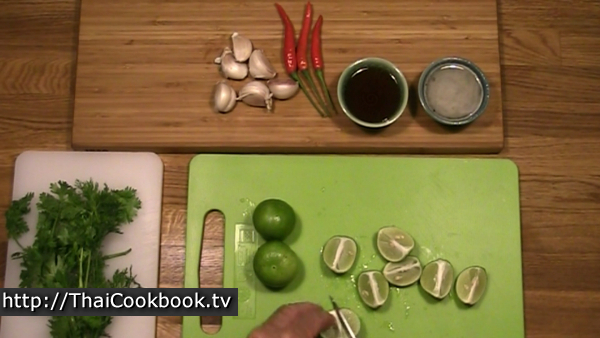 Stir together the lime juice, fish sauce, and sugar syrup. Add the garlic and chilies, and stir them in well. Let the mixture sit out for about 20 minutes to blend the flavors. Add the cilantro just before serving. 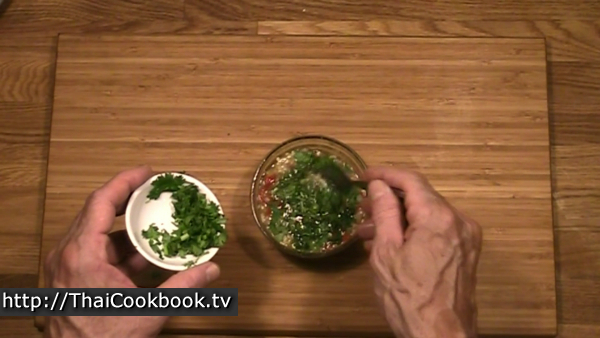 5 minutes or less before you serve, gently stir in the cut cilantro leaves. 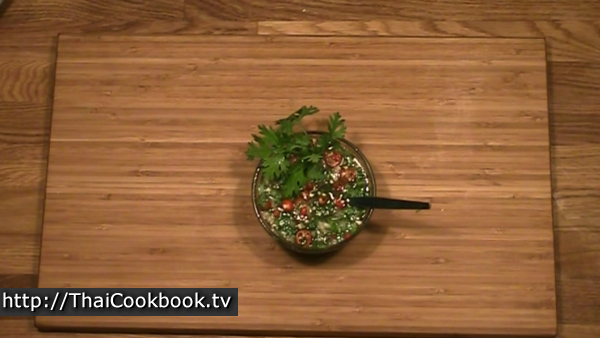 Add a sprig of cilantro as a garnish.